New eye clinic is looking out for residents of Riverview. People are excited about living in Riverview now. It’s an up-and-coming town just east of Tampa and south of Brandon that is experiencing rapid growth with new homes, restaurants and entertainment venues cropping up almost daily. Its population has exploded according to the latest census data. Of course, more people means more needs, especially health needs. Dr. Chen’s specialty is working with children such as Michael (right). 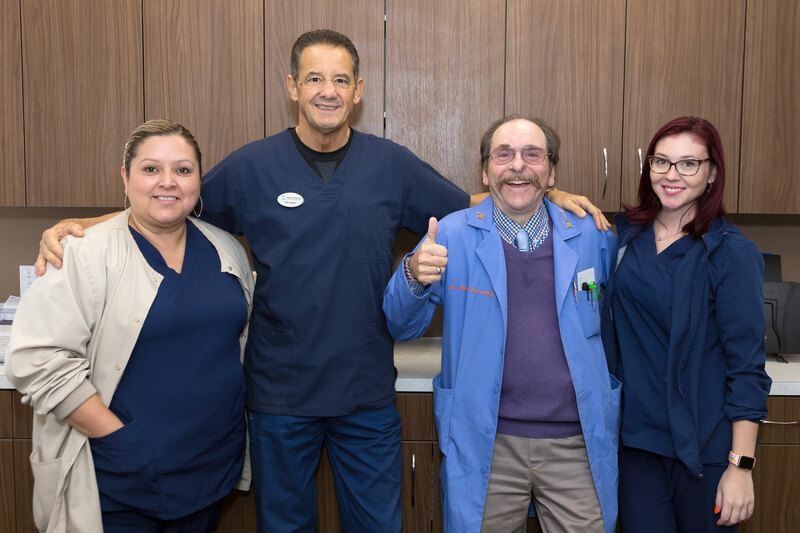 In response to these mounting needs, Florida Eye Specialists & Cataract Institute, based in Brandon, opened a comprehensive eye clinic in Riverview, expanding its family of regional eye care centers. Florida Eye Specialists & Cataract Institute at Riverview was christened on April 9, 2018. The clinic is brand-new and has four spacious exam rooms. Physicians in multiple specialties, including retina specialists, will rotate through the clinic, so Riverview residents won’t have to travel for specialty eye care services. The physicians have the highest level of technology available for testing and treatment. “We have a piece of equipment called an OCT that takes three-dimensional pictures of the retina and a state-of-the-art peripheral visual field machine,” describes Dr. Luxenberg. “We’ve also got two lasers, an argon laser and a YAG laser. These lasers are used to treat various eye conditions. One of the conditions Dr. Luxenberg will concentrate on treating at Florida Eye Specialists & Cataract Institute at Riverview is glaucoma. It is a common condition; it’s estimated that more than three million Americans aged 40 and older are living with the disorder. Glaucoma is an insidious disease that causes damage to the sensitive optic nerve, leading to a gradual loss of sight. Most often, glaucoma is associated with increased pressure in the eye, which injures the optic nerve, the conduit made up of millions of nerve fibers that carries messages from the retina, the light-sensitive tissue at the back of the eye, to the brain. Pressure builds in the eye when there is a back-up of the eye’s natural fluid. This fluid, which is called aqueous humor, flows between and nourishes the lens and cornea. It then drains back into the bloodstream through a honeycomb of channels called the trabecular meshwork. Thus, it is produced inside the eye and escapes through the eye’s drainage canals. This drainage system allows the pressure to maintain a certain level. If the drainage canals become clogged, which can happen over time or suddenly, and the outflow of fluid is obstructed, the resulting increased pressure can lead to the development of glaucoma and to damage of the optic nerve. “There are different types of glaucoma, including open-angle glaucoma, also called wide-angle glaucoma,” describes Dr. Luxenberg. “This is the most common type and represents about ninety percent of cases in the US. Other, less common types include closed-angle glaucoma, normal-tension glaucoma, congenital glaucoma and secondary glaucoma. The cause of normal-tension glaucoma is not completely understood, but most doctors and researchers believe it is related to reduced blood flow to the optic nerve. Congenital glaucoma is hereditary and is often diagnosed in very young children. It results when the eye does not form properly during development. Secondary glaucoma is the result of another condition, such as diabetes. With annual eye exams, glaucoma can usually be detected in early stages that have not yet been noted by the patient. Treatment started at this time can usually prevent progressive vision loss. Treatment is directed toward lowering the intraocular pressure with medical eye drops and/or various surgical procedures. From left, Vanessa Cepeda, Giovanni Caputi, Dr. Luxenberg, Casey Keefe. “I believe it is better to treat glaucoma with a laser, which is highly effective, than it is to treat it with drops,” observes Dr. Luxenberg. “Using the laser saves people the cost, irritation and inconvenience of the drops. It also prevents allergies and damage to the surface of the eye that can occur from the preservatives in the drops. The results of the laser treatment can last for the rest of the patient’s life, or it can last six months, depending on the extent of the patient’s condition. Dr. Luxenberg uses a technique that enables him to repeat the procedure if necessary. “I initially treat half of the circumference of the eye and see how patients respond,” he explains. “If they get a good result, which happens in about ninety-eight percent of cases, we wait and watch. If their pressure starts creeping up again, I can laser the other half of the eye. After that, we continue to use the drops. To treat open-angle glaucoma, the laser increases the effectiveness of the filter that allows the fluid to flow out of the eye. This decreases the build-up of fluid and, thus, the pressure in the eye. Another common condition being treated at Florida Eye Specialists & Cataract Institute at Riverview is blepharitis, an infection of the eyelids and eyelashes. Blepharitis commonly occurs simultaneously with dry eye. If left untreated, these conditions can lead to permanent eyelid and tear gland dysfunction as well as corneal damage. Blepharitis is most commonly caused by an overgrowth of bacteria that live along the margins of the eyelids and at the base of the lashes. Not only do these bacteria cause the symptoms of blepharitis, they also produce the substances that inflame the oil glands, called Meibomian glands, in the eyes, causing dry eyes. There are different types of blepharitis. Posterior blepharitis is the type associated with bacterial infection and symptoms of dry eyes. The inner eyelid is where the Meibomian glands are located. The eye complications associated with blepharitis and dry eye can be treated and possibly prevented if eyelid hygiene is properly undertaken. For years, hygiene options included cleaning the lids with diluted baby shampoo or eye scrub pads. Two years ago, an eye physician in Jacksonville invented a mechanized system for scrubbing and massaging eyelids infected with blepharitis bacteria. It works far better than both baby shampoo and scrub pads. It’s called BlephEx®, and it’s used at Florida Eye Specialists & Cataract Institute at Riverview. During a BlephEx treatment, a medical-grade micro sponge is dipped in a solution similar to that in the eye scrub pads. The sponge is placed on a small tool that resembles a drill, but instead of a drill bit, there’s the soft sponge. The tool gently spins to scrub and massage the eyelid margins, cleaning and exfoliating the eyelids and lashes and relieving symptoms. “The BlephEx removes all the debris around the base of the eyelashes and helps keep the lids cleaner,” confirms Dr. Luxenberg. “That takes away the food for the bacteria causing the redness and inflammation around the eyelids that occur with blepharitis and dry eye. As a pediatric ophthalmologist, Dr. Chen sees children and teens from birth to age 18. Generally, she first sees a child for an eye exam when he or she is around five years old and has failed a routine vision screening by a family doctor or at school. Recommendations for starting routine eye exams for children vary depending on their backgrounds. “If there’s no family history of eye problems, children usually get screened by their pediatricians prior to entering kindergarten,” she educates. “That’s how many initial eye concerns are caught, and the children are sent to us for further evaluation. Dr. Chen treats all of the eye conditions that are commonplace during childhood and adolescence. Three that can be corrected easily with eyeglasses are myopia, hyperopia and astigmatism. These are all refractive errors – vision problems caused by the eye’s inability to properly focus light on the retina to form a clear image. Myopia is also known as nearsightedness, and hyperopia as farsightedness. Astigmatism is an irregularity that forms in the corneal tissue, causing part of the cornea to be steeper along one axis than another. Amblyopia, also called lazy eye, results when the eyes’ acuity develops unevenly. The brain accepts the visual images from the stronger eye and ignores the images from the weaker eye. Affecting four in every 100 children, the condition can be treated with eye drops or by placing a patch over the stronger eye, forcing the weaker eye to work harder. Strabismus, or crossed eye, occurs as frequently as amblyopia and results from a misalignment of the eye muscles, which interferes with the ability of the eyes to work together. One eye may appear to drift, seemingly looking up, down, in toward the nose or out toward the cheekbone. Children coping with strabismus may squint one eye in bright sunlight or complain of eyestrain or headaches when trying to read. If the affected eye goes untreated, the child may develop amblyopia as a result of strabismus. On the days Dr. Chen provides her services at the Riverview clinic of Florida Eye Specialists & Cataract Institute, the office becomes a child-friendly oasis. The environment and the personnel are all dedicated to the needs of children. Dr. Chen. “I’m a fellowship-trained pediatric ophthalmologist who’s been in practice for twenty-one years, and my staff is specially trained to make the exams as easy as possible for the children. For Dr. Chen, being a pediatric ophthalmologist is very satisfying. In addition to working with children, pediatric ophthalmologists can make a significant impact on a child’s future. “The thing I like most about working with children is that you can really make a huge difference in their lives,” she acknowledges. “If you can improve the ability of a child to see, you can impact how they perform in school. For teenagers, if they have misaligned eyes and you straighten them, it can really make a difference in terms of their self-esteem. These services for children, as well as comprehensive care for adults, are now available at Florida Eye Specialists & Cataract Institute at Riverview.